From prehistoric pyramids to secret military bases, there's not much conspiracy theorists haven't seen on Mars. Now, in their recent weird finding, alien hunters say they have found a mysterious 'facehugger crab' on Marian surface. Since the photograph was shared on Facebook, a lot people have said it looks like the facehugger monster presented in the 1979 film, Alien. 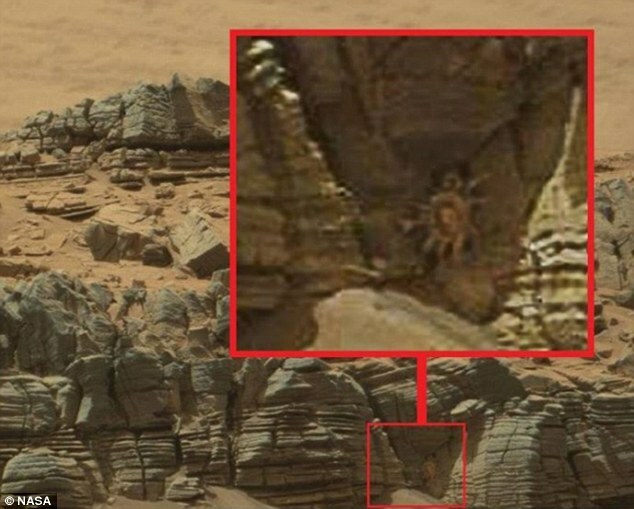 The 'crab' can be seen in a photo captured by the Mars rover Curiosity which displays a formation that appears a cave mouth on the red planet. The photo was captured by NASA in July but lately appeared in Facebook group 'Journey to the Surface of the Mars', who has the motto: 'They will not tell the truth about Mars'. Director of the Centre for SETI Research, Seth Shostak said this is possibly a case of pareidolia.